Wow – Haven’t seen this since grade 6 or so. Much scarier then. This thriller/horror film came out in 1997, obviously riding the wave of road movies (like Steven Spielberg’s Duel and Roger Corman’s Death Race 2000) and stars James Brolin. The story? A possessed, black, evil driver-less car starts killing the people of made up Utah town Santa Ynez. One by one this black evil car ( a Lincon I think) is running down and generally terrorizing this town and it’s people. The police force, and primarily James Brolin’s character are forced to deal with the menace. The film is set in the fictional Utah community of Santa Ynez. Two bikers are cycling on the canyon, and a mysterious blackLincoln Continental Mark III is following them down the road. At the bridge, the car rams them at the back, causing them to fly over the bridge, killing them on the spot. The police is called to the first of a series of hit and run deaths, apparently caused by the same car that appears heavily customised and has no license plate, making identification difficult. Sheriff Everett Peck (John Marley gets a lead on the car when it is witnessed by Amos Clemens (R.G. Armstrong) after it runs over a hitchhiker. 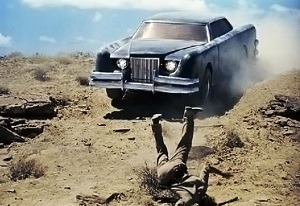 After the car claims its fourth victim, the sheriff itself, while trying to kill Amos, it becomes the job of Captain Wade Parent (James Brolin) to stop the deaths. During the resulting investigation, an eyewitness to the accident states that there was no driver inside the vehicle. Despite a police cordon being placed around all roads in the area, the car enters town and attacks the school marching band as it rehearses at the local show ground. It chases the group of teachers and students, among them Wade’s girlfriend Lauren (Kathleen Lloyd), into a cemetery. Curiously enough, the machine will not enter onto the consecrated ground as Lauren taunts the purported driver that any of the townsfolk have yet to see. Seemingly in anger, the car destroys a brick gate post and leaves. The police chase the automobile along highways throughout the desert before it turns on them, destroying several squad cars and killing five officers in the process. Wade confronts the vehicle and is surprised to see that none of his bullets put a dent on the car’s windshield or tires. After trying to open the door, Wade is injured, and the car escapes. The hunt for the car becomes a personal vendetta for Wade when the automobile stalks and eliminates Lauren by driving straight through her house, right when he is speaking to her over the phone. Wade’s deputy Luke (Ronny Cox) puts forward the theory that it acted in revenge for the insults hurled on it by Lauren and notes it cannot enter hallowed ground. Wade concocts a plan to stop the car by burying it beneath a controlled explosion in the canyons that lie outside of town. After discovering it waiting for him in his own garage, he is forced to carry out his plans post haste. He is pursued by the car into a mountainous canyon area where his fellow officers have set a trap for the machine, and a final confrontation settles the score with a demonic visage appearing in the smoke and fire of the explosion. shocking the police officers. The final scenes show Wade refusing to believe what the group saw in the flames, despite Deputy Johnson’s insistence about what he saw. 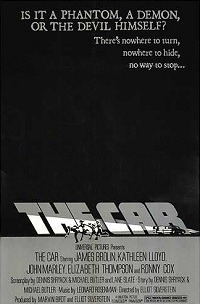 The film concludes, in some cuts, with the car prowling city streets, clearly having survived. That is The Car. Watch it? If you want – you’re not missing much if you don’t. This entry was posted on July 2, 2012 by catfishman. It was filed under Uncategorized and was tagged with 1977, film, funny, grindhouse, horror, James Brolin, lincon, movie, scary, sci-fi, stupid, The Car, thriller, waste of time.